Corporate Marketing & Product Development Experience working with many companies both publicaly & confidentially within North America, Europe, Middle East and Asia. US Department of Defense, & Aeromotive Research and Development Group. Quality Control, Goverment Agency & International Liason Services. William Balmes - Graduate of multiple OEM & Technical Mechanic studies including ASE certification, Chrysler, Hynudai and Ford Motor Company. Brings over 20 years of hand on engineering application an business experience in a variety of areas. SynMax Performance Lubricants & Aeromotive Research & Development Group. Technical & Office Dutied Include: Business Operations, Office Operations, Logistic & Shipping Operations, Corporate Sales, Product Development. Logistics & Shipping Services. New Car Dealership Owner & Management - Recently 20 years of Medical services & development procurement. Spartacus Group, Inc. is a Female / Minority owned business. 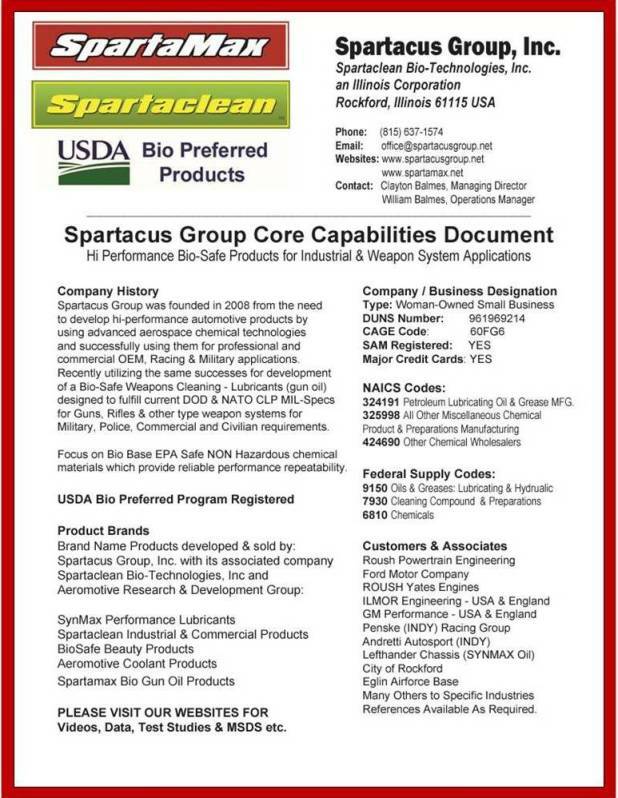 Click picture below for Spartacus Group capability statement - document.. pdf download.